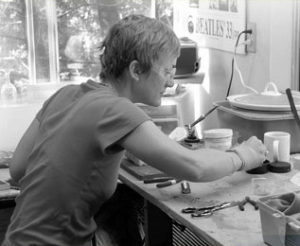 All of my jewelry is constructed of sterling silver, gold, semi-precious gems, enamels and is hand fabricated. I enjoy finding ways to integrate color into my pieces using unconventional materials instead of gems or precious stones. Also, I know what my pals and I like to wear everyday and when we go out – It’s easy to stay inspired surrounded by hip, positive, stylish girl friends! I was born and raised in St. Joseph, Michigan. I earned my B.A. from Michigan State University in Studio Art and have been messing around with metals and jewelry design for a while at San Francisco City College and The College of Marin. Also, I was recently selected into the American Craft Council’s Artist Mentor Program. I just love to make jewelry. Enjoy my work and come see it in real life at The Marin Jeweler’s Guild in downtown San Rafael, California 1331 4th Street or call me for a private showing at 415-250-1761.